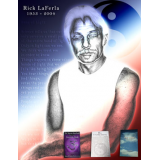 Rick LaFerla: Thinker, Poet, Radical, Professional Poker Player & Dealer, Friend, The first Author I ever published. On the Edge of Decency is a compilation of diary, autobiographical tidbits, news events and current issues, some story telling, ranting and raving, sarcasm, humor, and of course poetry. We live in edgy times with Lots of edgy people. Read about them all in Rick LaFerla's On the Edge of Decency.